Just what air compressor do you need to do the jobs you need doing around the home, garage or even the site? This air compressor buyer guide is to help you to choose the right air compressor for your application, whether it is for home, garage or contractor use on site. There are many factors to consider when buying a compressor and this buyers guide will seek to help you understand those factors. An air compressor provides volumes of air under pressure to power pneumatic tools and for inflation, cleaning and other jobs around the home, garage and business. The tools that you can use are generally cheaper, more reliable and more efficient than their electrical equivalent if there is an electrical equivalent as often there is not! They work through an engine (gas or electric) powering a pump that forces air into a tank under great pressure, for most home air compressors 125PSI or more. This compressed air provides the power required for your air tools and other applications. What's the right Air Compressor? The selection of air compressors available is huge, all sorts of different shapes, sizes, powers weights and noise levels; so trying to choose the right one for you can often be a daunting task and you can often buy the wrong one if you do not know what you need. My first compressor I bought as an impulse buy when I saw it on sale in a store thinking I could use it for all sorts of things. I hooked it up in my garage and only used it to make sure my tires were the right pressure for about 3 months before I decided to buy some tools like the ones that they used where I worked. I was planning to do some work on my car so I bought an impact driver and a ratchet hooked them up to my compressor and set to work - well it had enough power to open a can of corned beef if you started the key by hand first! I learned from this mistake and went off to read up on and educate myself about air compressors! The following sections will go through the important features that you have to consider when buying. What pressure does my air compressor need to run at? Some compressors will pressurize the tank to 200PSI which means that there is a much larger volume of air in the tank allowing you to use a smaller tank to achieve the volumes you require. There are also some tools such as some of the framing nailers that will operate on these higher pressure to drive nails into even concrete. What is the right tank size? How big an air tank do I need for my Air Compressor? The pressurized air is pumped into the tank where it is stored for your use, this volume of air is what provides the power for your tools. So looking at it simply a small one gallon tank only contains a small amount of stored power whilst a 120gallon tank contains a huge amount of stored energy. You have to consider the types of work you are going to be doing before you decide on the tank size that you require. If you are only doing a small amount of work using a brad nail gun or stapler and some inflation and cleaning work then a one gallon tank may be sufficient. If you are looking at doing light work but for longer periods of time such as driving nails into a small deck then a 4 to 6 gallon tanks will service your needs. If you are going to be running multiple tools or using tools such as a sander that requires a constant flow of air through it to provide power then you are going to need larger tanks 8, 15, 30, 60, 80 gallons or more! Just remember that the larger the tank the more stored power you have and the longer you can run your tools before the compressor has to switch on to refill those tanks. So if your tools empty your tanks quickly you will find your pump and motor have to run more often causing excessive wear and tear and you may also find yourself having to pause your work as the tank fills! Therefore choose as big a tank as you can get for your application within your limitations; space, weight and money! The tank size and its pressure provide you with your power and this is measured through something called CFM (Cubic feet per minute). How much power will my air compressor deliver? CFM or Cubic Feet per Minute is a measure of the volume of air that can be supplied at a given pressure, it is also known as SCFM or standard cubic feet per minute. For most compressors the available CFM is quoted at 40PSI and at 90PSI and you can then compare these figures against the requirements for your air tools. Each air tool with have an optimum pressure and requirement for CFM to operate efficiently. Failure to meet these requirements will result in a tool that either does not operate or operates for a short period of time at a lesser efficiency. These are typical requirements, you should check the actual requirements of the tools that you wish to use before purchasing your air compressor. A powerful 11.3CFM @90PSI, enough to power most tools. Is the listed HP for my Air Compressor correct? What HP air compressor do I need? The power of the motor is measured in horse power (HP) and this will be the deciding factor in how quickly the compressor can fill the tank. A 2 HP motor on a 4 gallon tank will have filled in a matter of a few seconds, whereas a 1HP compressor motor on a 15gallon tank will take some time to refill it! If you are going to be making constant use of your compressor then you will want as powerful a motor as possible to ensure that you do not have periods where you are waiting for your tank to be filled before you can use your tools again which sometimes happens with smaller compressors. However if you want to use a compressor at home you are unlikely to want one that has more than 1.5HP to 2HP without having to provide dedicated circuits and breakers to power them. Smaller units with 1HP or smaller motors can be safely run even on a standard extension lead. Most compressors require larger amounts of power when they start up so you may find that your breaker will trip when you use some of the larger compressors so investigate the power requirements and read the reviews before you buy; not all require 120V also, some require 240v or even three phase etc..
Will I be able to move my air compressor? If you are going to want to move your unit around then you are going to need to make some trade offs with regards to size and power. If you want a portable air compressor that is small and easily carried then you will not be able to take a 15gallon tank up a flight of steps tucked under your arm! There are many lightweight small air compressors out there on the market but their power and ability is going to be limited by their size. You can however buy compressors that are arranged like a wheel barrow with wheels that make them easily maneuverable around a site. Try to choose ones with pneumatic tires however as these are tougher over a site and reduce the vibration and noise of the compressor in use! Do I need a gas powered air compressor? A gas powered air compressor is going to be more expensive and heavier than its electric equivalent. However they generally have more powerful compressors for quickly refilling tanks and you can use them anywhere without having to worry about a power supply. Obviously you cannot use a gas compressor inside due to its exhaust and a gas powered compressor is going to generate more noise and be more expensive to run than its electrical partners. Portable Gas powered air compressor. Can I get a quiet air compressor? If you are going to use a compressor in the home or use it as a garage air compressor then you need to consider the amount of noise that it makes. Compressors are generally noisy beasts, most being a 100dB or more (use this article about decibel levels to understand noise), this means that you should use hearing protection when using them, especially in a confined space where the sound is amplified. You also need to consider your family and neighbors and try to choose a quiet air compressor! smaller compressors are generally quieter than the larger models and some manufacturers are now making compressors that are very quiet, almost silent compressors! There are some that provide reasonable power but only create 60dB of sound which is less than a normal conversation! Only 60dB in operation, a really quiet air compressor. 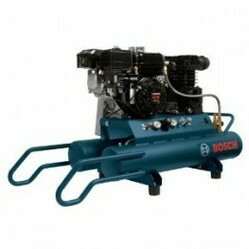 Oil vs Oil free compressors. Do I need an oiled compressor? If you need to ensure that your air is free from oil such as when you are doing airbrushing then you may want to use an oil free compressor. An oil free compressor is easier to use and removes many of the maintenance worries for those less capable. Oil free compressors however are not generally as powerful as the oiled variety and are normally noisier although not always! An oiled compressor will give you more power and last longer so these are the better buys if you are looking to do more demanding work. How reliable will my air compressor be? Reliability is a big issue with anything that you buy and an air compressor is no different. With the high price of many compressors it is worth doing that little bit of extra homework and checking the air compressor reviews for your proposed purchase. But remember to actually read the reviews not just look at the stars, many portable air compressor reviews are negative, not because the compressor is defective buy because the user is expecting the performance of a bigger more expensive model! Emglo is one of the most respected names in compressor manufacture. 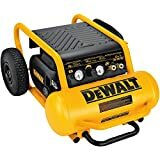 What air compressor should I buy? What do I need to look for in an air compressor? I hope that this air compressor buying guide has answered your questions and helped to educate you about what you need to look for when buying an Air compressor, if you have any questions or comments please leave them below. How does my air compressor work? The portable ones sound very handy.